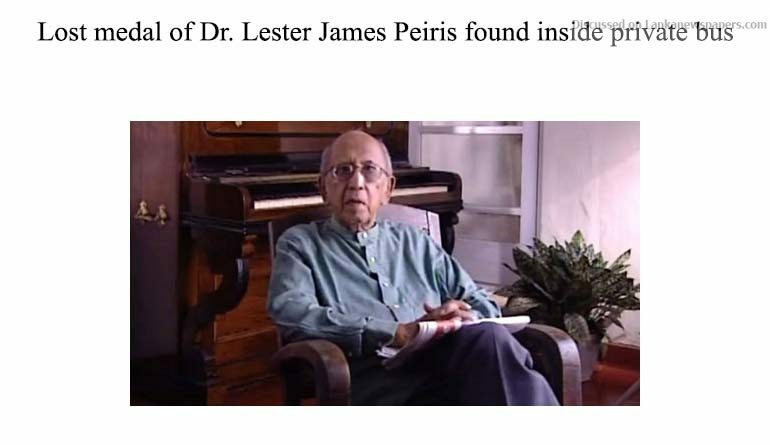 Lost “Golden Peacock” medal of late Dr. Lester James Peiris has been found on an overhead rack of a Kollupitiya-Kaduwela 177 route private bus, Police Spokesman SP Ruwan Gunasekara said. The medal received along with the ‘Golden Peacock Award’ won by the late Dr. Lester James Peiris in 1965, reportedly went missing on May 02 during the funeral activities. The funeral of the legendary Sri Lankan filmmaker, who is the pioneer of authentic Sinhala cinema, was held on May 02 at the Independence Square in Colombo with full state honours. Dr. Lester James Peiris had received the medal when “Gamperaliya” (Village Upheaval) won the Golden Peacock Award for best feature film at the third New Delhi film festival in 1965. This was the first time a Sinhala film had won an international award. ← Mahinda comes to Ranil’s rescue once again!